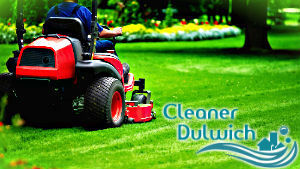 At our company, we strive to provide the highest quality grass cutting services in Dulwich possible. If you demand value at moderate rates, flexibility in terms of scheduling and professional gardeners taking care of your outdoor areas, we think the service we offer will greatly appeal to you. We don’t believe in hidden costs and unpleasant surprises, which is why we evaluate the condition of your lawn and determine pricing in advance. Choose us for healthier, greener lawn that lives up to its full potential! Providing services that live up to the highest standards in the trade is of paramount importance to us as we strive to achieve a long lasting relationship with our customers, based on trust and respect. Because of this, we always offer free evaluations to set the price and determine what the needs of your lawn are. The team of gardeners we work with, consists of experienced, enthusiastic and competent individuals who will go out of their way to deliver the impressive results customers have come to expect and demand from us. We always take our customers’ individual requirements into consideration. If you want your grass cut in a specific pattern, be it chequerboard, criss-cross or stripes, share your requirements with the team. The edges of your lawn, driveway and flower beds will be diligently trimmed, lending your lawn a neat and well-kept look. Once the team is done cutting the grass, they will collect the waste and spray against weeds and commonly spread lawn pests like larvae, earthworms and leather-jackets. Upon demand, we will readily perform a set of other gardening tasks for you like mulching, aeration of soil, and the likes. If interested in booking our quality grass cutting services in Dulwich, reach us over the phone or online!